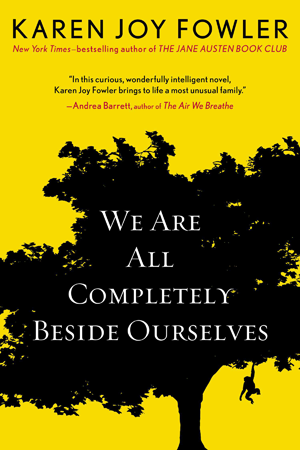 Karen Joy Fowler's new novel, We Are All Completely Beside Ourselves, came at an opportune moment in my life. After spending years looking for the "Not Tested on Animals" label on products in a desultory manner, I decided to do some research and found out just how little that phrase means. It can go on products from companies that subcontract out their testing or that buy their ingredients from suppliers that test. Finally landing upon the Leaping Bunny certification website, I found that only a few mainstream beauty companies' products are completely free from testing: Paul Mitchell hair products, Burt's Bees, The Body Shop, Urban Decay, and a few others. And I resolved to buy only from those companies. The existence of animal testing in the U.S. is curious. We are a country that loves animals. We share our lives with our pets, care for them when they're sick, take them out for exercise when we're sick, roughhouse with them when we'd rather sit on the couch. All over my neighborhood, probably like yours, poor sods troop through the mud to walk their dogs when it's pouring rain. We post photos of kittens and puppies online and are genuinely, deeply moved when we watch videos of cross-species friendship, be it between a goat and a donkey or a dog and a baby. We know that there is something precious, even holy, at work here. And then we go to the store and pay companies to torture animals. The twentieth century has been called an age of horrors because of the multiple genocidal acts that plagued it. But it also saw the rise of an unprecedented attention to the rights and well-being of others. The intensity of our moral gaze deepened and spread, from women to children to gays to the poor. And to animals. It's clear to us how contradictory it was for the ancient Greeks and Romans to expound on ethics while taking slavery for granted. For the Victorians to moralize while sending children to work in factories. Just so, generations to come may scratch their heads at our blithe acceptance of torturing animals for the sake of eyeshadow or laundry detergent. We can connect, morally, the slaves and the slaveowners, the children workers and the rich industrialist. But we don't connect ourselves to the animals we pay other people to torture. This disconnect is the starting point for Karen Joy Fowler's powerful new novel We Are All Completely Beside Ourselves. Rosemary is five years old when her sister Fern is mysteriously sent away from the family. Fern and Rosemary had been almost like twins: nearly the same age, constant companions. But, in an early reveal that I hate to uncover here, we learn that Fern is a chimp that her parents brought into the family when Rosemary was born in order to study their comparative development. Both Fern and Rosemary have spent nearly every waking hour of their lives in each other's company, and when Fern is sent away (for reasons that are slowly revealed throughout the book), Rosemary is devastated, not only by the loss of Fern but by the anger and eventual disappearance of her beloved older brother. The rest of the novel tracks the effect of Fern's departure on the family. And while Fowler's plot is strong, it constitutes only one portion of the genius of her novel. The novel delves deeply into issues that have rarely been treated in literature, like attachment. Attachment, in the technical sense, refers to the psycho-physiological state that results from the steady, reliable presence of a particular person or people in one's life. It is the foundation of health for humans; babies who are not able to attach to a parent figure (because of neglect, for example) develop, essentially, permanent brain damage . Literature often deals with grief and pain from loss or death. But I can think of only one other novel that, obliquely, deals with the fallout from broken attachment: the His Dark Materials trilogy by Philip Pullman, in which all humans are connected from birth to a "daemon" animal by a thread of soul. Because Fowler's theme is our interconnectedness, she never lets Fern out of her sight. The agony of the novel is not just the life of Rosemary's family without Fern but the terrible glimpses they have into Fern's life without them. The role of sight, the imagery of windows and mirrors, is key to Fowler's art. Rosemary's brother Lowell, who left home as a teenager to try to find Fern and became an animal activist, says it this way: "The world runs . . . on the fuel of this endless, fathomless misery. People know it, but they don't mind what they don't see. Make them look and they mind, but you're the one they hate because you're the one who made them look." If this sounds like a difficult novel, it is. But, unlike the pain of animals caged and tortured for bubble bath, it's not a pointless pain. The novel is rewarding, which is the best thing you can say about a work of art. And it's complex and literary in more ways than could be recounted in one sitting. Like Cloud Atlas, it's a novel about morality, about "issues," and yet manages to be a complete work of art, never for a moment becoming a tract or essay. Like Cloud Atlas, it's a novel I'll treasure for both its artistry and heart.